I don't manage to keep in touch with all blogs that I follow as often as I'd like, but equally, with a blog as thought-provoking as Temposchlucker's, sometimes I am glad that he doesn't post every day : it would be just too much to cope with ! Catching up yesterday, I saw his post from a few weeks ago entitled "Precision" with an example of a problem from Chess Tactics of a 'crushing attack by White'. ( see also the examples in the comments to his post). I can't disagree with him, it was an example of a crushing attack and I did see it eventually, and didn't see it quickly for exactly the reasons he gives ! 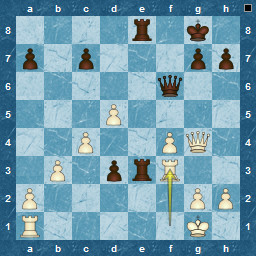 In the diagram below, White has just played Rf3 disconnecting his back-rank rooks. I felt I had the had the advantage, but it still took me too much time to see the move. Sometimes, we try to look for the complex, when the simple and obvious is what we need. Convekta are offering their main database software in a "lite" version, ie a free chess database. 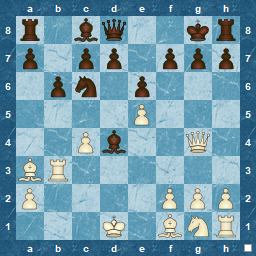 I own and use Chess Assistant 11 (CA11) and find it incredibly useful for searching, comparing and preparing for games. It has far more functions than I would use on a regular basis, but is excellent for its main purpose : storing and classifying games. Yes, it has its quirks and its failures, but I dare say Chessbase has too. Convekta are very helpful, but they don't seem to want to solve some of the issues that CA has ( and worse, have the irritating habit of announcing a new version that has no extra functionality or even fixes : CA12-CA18 is practically the same as CA9, the last major update. The differences are that new databases of games or Opening Encyclopaedia are included ). No pictures of chess players. Seems pretty good to me, and if you just want a database then the limit of a million games ( although dwarfed by the size of commercial ones of 4 or 5 million ) is easily enough for a club player. If this also means you get to try out the superb search functions ( including an enhanced CQL ) and play around with classifiers, you will enjoy it even more, and it might just persuade you to go for the full version. Also worth mentioning, is that these days Convekta also offers a free games update service. These games used to be pay only ( usually if you bought the Professional CA package, the games update was included ). Now the basic games are free, but you can also pay for the service and receive more games, some of them commented. This free service is a bit like the TWIC one now. Not sure which is better ( in terms of either quantity or quality or consistency). I use both in separate databases. I mentioned here that the Guardian's chess column had gone. Well, its both true and false ! The Bennett/King column has ended, but the Guardian does have regular chess coverage here. Apart from the occasional ( and usual ) reports on events such as Wijk-aan-zee from a stalwart of English chess. Leonard Barden ( he and Harry Golombek probably wrote most of the early chess books I borrowed from the library !) , they also have reportage on chess topics. The latest is a mention of how chess in schools has been launched in countries like Armenia, India and Norway, and the efforts by people such as Malcom Pein ( London Chess Classic organiser ) to encourage this in English schools. The comments on the article are varied and interesting. I have to say that I played in my own school chess club, although I don't recall anything other than internal competitions ( for the "House Cup" as Harry Potter would say ), and I carried on at my Sixth Form college ( pre-university ) when I was tutored by the County Champion. Mind you the group there was so small, that we did lots of fun chess, especially Kriegspiel ( well spotted..a lot of the time there were only 3 of us ! ). It was very enjoyable. I have none of the games from that time, but I do have a few from when I took it up again as an adult, and played for the local town club, even competing in the County league ! Amusing to look through now, as I evidently didn't put much into ' study'. Club nights were held in a pub, so the social part was as important as the chess ! I should really look through them again and publish my youthful efforts ! Get yourselves over to Robert Pearson's blog, where a new phase of the year-old Chess Carnival has emerged. This is the first of a number of posts , featuring the " Best of" chess blogging. First one is about openings.